The Conservatives would give the Bank of England greater regulatory powers to try to prevent future financial crises, shadow chancellor George Osborne says. Reforms are needed that match the "scale of the hardship inflicted on the British people", the Tories said. Treasury minister Lord Myners said the Conservative plans would cause "considerable disruption". The government wants to create a new council to oversee financial stability, but keep the current regulatory system. 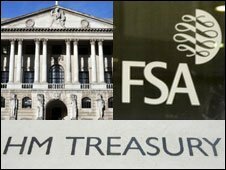 The council would see the Financial Services Authority (FSA), the Bank of England and the Treasury meeting regularly and reporting on the systemic risks to financial stability. But Conservative leader David Cameron called the council "effectively the same three organisations with nobody in charge and nobody taking responsibility". Meanwhile, the Liberal Democrats say that taxpayer-owned Lloyds and Royal Bank of Scotland should be broken up. Lib Dem Treasury spokesman Vince Cable said that large, failed UK banks were the "financial equivalent" of the Chernobyl nuclear disaster. • asking the Office of Fair Trading and the Competition Commission to investigate the effects of consolidation in the retail banking sector. Mr Osborne said it had been a mistake to separate central banking from "an intimate involvement and knowledge of the banking system". "Above all, the cultural experience of a central bank gives it the confidence, not just to insist that rules are followed, but to exercise judgement," he said. He also suggested that there was a case for separating a bank's riskier activities from deposit-taking, but only after taking international developments into account. "I believe there is a case for separating some of the riskier investment banking activities, such as large-scale proprietary trading, from retail banking, but that it would not be sensible or, indeed, effective to impose separation unilaterally," he said. The BBC's business editor Robert Peston says the Tories' proposals are "hugely significant". Giving the Bank of England power to regulate individual banks totally enfeebles the Financial Services Authority (FSA), he says. The Tories, in their 52-page "plan for sound banking", also propose a raft of measures to protect and empower consumers. These would include transforming the rump of the current FSA into a consumer protection agency and also forcing banks to give consumers more useful information on what they charge. But Treasury minister Lord Myners said the proposals "shuffle chairs around" and accused Mr Osborne of showing "considerable naivete". "It puts a person [the governor of the Bank of England] in charge who doesn't want to be in charge," he said. "George Osborne is going to cause considerable disruption if he is ever given the opportunity to implement these plans." Meanwhile, Mr Cable told the BBC that while he agreed with the Conservatives on the basic issue of economic management, he accused them of being "obsessed by moving around bureaucratic furniture". Instead, it was necessary to focus on the way regulation worked, he said. Speaking later at the London Stock Exchange, Mr Cable argued that major reform was needed to make banks less of a threat to the UK economy. There was a long-term role for state banking, he said, adding that the banks in which taxpayers have a stake should be broken up into smaller parts before being returned to private ownership. Mr Cable also called for highly-paid bankers to publish details of their pay and bonuses and repeated his calls for the FSA to keep its role as banking regulator. 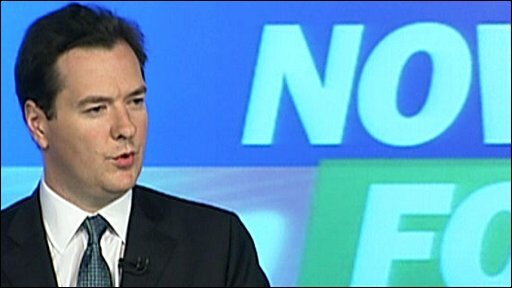 "Some aspects of the financial services industry are simply too big for the British economy to manage safely," he said. "The large, failed, British banks are the financial equivalent of Chernobyl. Like the former Soviet Union, the UK became over-reliant on dangerous financial reactors." To prevent Britain from becoming the next Iceland, "radical safety measures" were needed, he said. "My approach to the City is not one of hostility, or of obsequiousness. I recognise its importance. "But it needs 'tough love', not the freedom to run amok."